Blue Spring is one beach resort in the southern part of Malang regency, East Java. 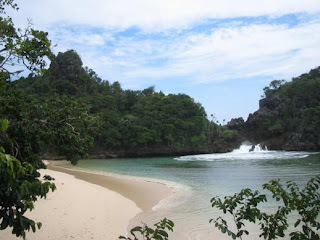 that is free from tumulous waves due to the presence of the Indian Ocean Sempu Island, about 300 yards offshore. On the other side of the beach now use ‘as a debarkation Port of Fisheries and Fish Centre PPI where fishermen haul them down where they are under the authority of the Department of Fisheries and Managed by the KUD (Koperasi Unit Desa), “Mina Jaya Pondok Dadap”. Officially, the beach is managed by Blue Spring State-owned Companies Forestay which has so far provided the beach with inns, guest houses, shops, guard houses, boats, etc. To reach Blue Spring, visitors can take public transportation which can be accessed called “Mikrolet” for Tower – Turen – Blue Spring. Blue Spring about 70 miles south of the village Tambakrejo Malang, Malang regency Sumbermanjing Wetan. Blue Spring Visit beautiful beaches and enjoy the waves of interest with white sand that spreads along the coast.